Grout Shield Distributors LLC has moved! Grout shield distributors, manufacturers of top off the line floor products, has relocated from New York to Fort Myers Florida. As a family run business all of the key personnel will remain in place and there will be no drop off in quality, delivery, and service regarding our products. We take great pride in providing the public, as well as the industry in general, with the very best grout colorants and sealers available on the market today. None of that has changed! Grout Shield will continue to provide the very best products, as well as, the very best in customer service! 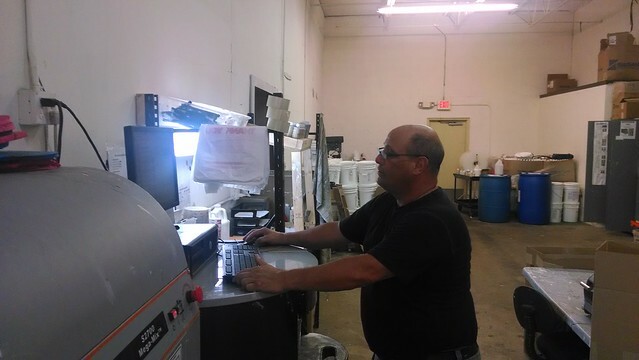 Mike Stracuzza, owner of Grout Shield Distributors LLC, mixes a custom order of grout sealer for a client in his new Fort Myers Florida warehouse. And we will definitely miss the crack of the bat app Yankee Stadium watching our beloved New York Yankees play!!! I guess when it’s the middle of winter, and the wind chill up north is somewhere around 30 degrees below zero, we will just have to tough it out in the subtropical paradise of Fort Myers! Shorts, sandals, and a t-shirt in January sounds pretty good to me! We WILL continue to provide the very best products and the very best in customer service to our valued customers as we always have. The only difference is we will now be distributing our most grout Products, and providing that great customer service from the relative comfort of Southwest Florida. I bought some grout shield awhile ago. I unfortunately had a stoke before I was able to start my project. I bought the C-Cure Ocean Blue. My question is is there a shelf life on both the color seal and the deep cleaner?